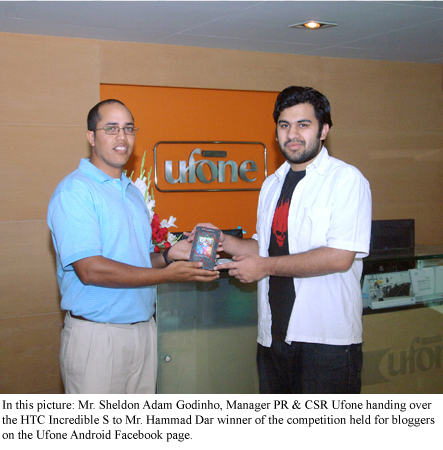 Ufone in collaboration with HTC, hosted a blogger’s meet-up at Marriot – Islamabad, last month. Meetup was to introduce its recently launched HTC Incredible S.
Representatives of Ufone, Brightex (Sole Distributors of HTC in Pakistan) and Google were also present at the ceremony. More than 35 bloggers from Islamabad and Lahore attended the event and 2 out of them won HTC Incredible S smartphones through lucky draw at the occasion. Ufone had promised another HTC Incredible S for participant bloggers who will get most likes and comments made on Ufone Android Facebook page. Mr. Hammad was recently declared winner of the third HTC Incredible S as he got most likes and comments made on Ufone Android Facebook page. That’s a very good step from Ufone.